I am almost finished! Tackling my craft room and making it a usable space, rather than a storage room. I can actually sit and scrapbook! What a concept! Instead of just gathering (and hoarding) papers and other items, I can use them. I don't now have to wait for a retreat to get some serious work done. I can sit, in my own house and room, and work. Music on, computer there for resources and ideas...all while doing what I enjoy! Whoohoo! I have a large bookshelf and on that I have put many photoboxes, that are now refered to as "project boxes", as they contain specifics for certain scrap projects. For example, my Italy trip...that box contains photos, embellishments, trinkets, and pamphlets....anything to do with that scrapbook. I can then grab it, sit and have everything I need. I have labeled them and they are all bright and cheery. I then have started buying units for the modular storage system (above). I currently have 6 units and would love at least 3 more. They are a perfect size. 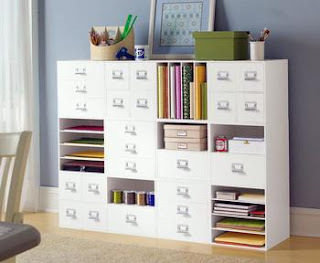 There is one unit with a large, deep drawer with dividers inside, creating 16 small spaces. 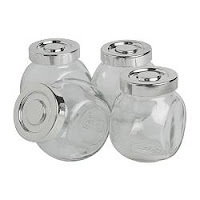 I found spice jars (clear glass and silver lid) that fit as though they were made for each other. Bought those last night and will be putting embellishments, flowers and anything else into those. Phew...now to finish my Las Vegas album...should be done in 30 minutes!